2mm carbon fiber main frame offers impressive durability and lightweight rigidity for this small platform. Prop guards offer peace of mind while flying indoors and protect the motors, propellers, and frame in a crash. Make it yours with various color option parts that are available for the Torrent. Micro Brushless FPV racing is all the rage and the Blade® Torrent FPV is the ideal racer for intermediate and competitive racers alike. This powerful and versatile 110 mm FPV racer can be flown indoors and out, but it fits inside your pocket. Propeller guards make it safe to fly inside, while the high torque brushless motors give it the authority to handle the great outdoors. The 2mm carbon fiber frame provides added durability while a 150mW VTX provides clean and powerful video in any environment. The 600TVL camera with 120 degree field of view lets pilots see clearly in tight indoor spaces or out in the backyard. A Betaflight configurable F3 flight controller offers full freedom to tune the flight characteristics to personal preferences and the Spektrum™ Telemetry Serial receiver gives valuable flight log feedback straight to the transmitter. Bind-N-Fly® completion level allows the competitive racer and intermediate pilots to have a successful flight, right out of the box. 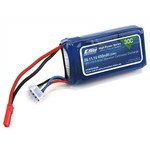 Simply add a 3S 450mAh battery and bind it to a compatible Spektrum transmitter.